Storm chasing is dangerously crowding rural roads. Rural roads are getting crowded during tornado season, and the dangerous conditions are all your fault. A tornado seen west of Dodge City, Kansas, moving north on May 24. Last week, the National Weather Service tallied more than 120 tornado reports across 10 states. All in all, that means it’s been a pretty average week in late May in the heartland—this is peak tornado season, after all. What’s less average is the traffic that Kansas and other tornado-prone states experienced. And not because people were trying to get out of the way of the tornadoes. It’s because storm chasers were trying to get to them. And those are just from two days in late May. Earlier this month, a storm chasing team that calls themselves “Basehunters”—a well-known group with more than 50,000 Facebook fans—flirted with the outer edges of a tornado in Oklahoma, all the while rolling film and calling chasers that were even closer “ballers.” At one point, their vehicle backs up at a high rate of speed on a highway as telephone poles are falling around them. At another point, as they drove through a toll booth without paying, one of the chasers says, “I don’t think we’re going to get a ticket, not with the tornado right there.”* Thankfully, that video wasn’t widely shared (and I won’t embed it in this post in hopes that remains the case). I’ve chased storms in Kansas and Oklahoma myself, so I know firsthand that chaser convergence can be kind of fun at times. There’s a good chance you’ll run into an old friend at the corner of County Road 203 and Bob’s Lane. I hear the Applebee’s in Salina, Kansas, was pretty busy last Wednesday night, too. So, to be clear: I have no problem with storm chasers (many of whom are meteorology students) who keep a safe distance from tornadoes and are out there to learn about, and witness, some of the most beautiful and powerful storms on the planet. But I don’t have many kind words for the people trying to get as close as possible, cameras rolling with dollar signs in their eyes, as bystanders’ livelihoods are destroyed. In 2014, after a particularly harrowing week on the Plains that included a viral photograph of a dying 5-year-old tornado victim, I wrote that tornado chasing as a profit-seeking activity is probably unethical. The wider backlash against tornado profiteering has done nothing to make people reconsider the hobby. As this debate continues in the chasing community, the crowds have only grown in size. This is causing extremely dangerous conditions. Tornadoes can be erratic, because duh. One badly timed traffic accident combined with a quick shift in wind direction would make for a major tragedy. In fact, with the traffic as it is, all you might need is just a tornado doing its normal thing to put irresponsible people in harm’s way. So far this year, storm chasers have consistently pushed the limits of safety and common sense. Earlier this month, a crackly video taken a few hundred feet away from a tornado near Wray, Colorado, racked up nearly 5 million YouTube views (Google it if you must). It was shot by infamous chaser Reed Timmer—whose ego has its own Twitter account. There’s even been a surge in tornado selfies. At the risk of sounding old, when I was a grad student at the University of Oklahoma in 2005, the internet was not yet mobile. Chasing was the truest test of your forecasting abilities—you sometimes had to plan for hours to choose the corner of the state most likely to see storms. That era is gone. Now, all you have to do is just follow the red dots on your weather app. You don’t need any meteorology experience to be able to do this. And on some days, near some storms in particularly rural areas, the ease of finding strong storms has pushed us to the point of chaser saturation. On May 24 near Dodge City, Kansas, the county sheriff set up a roadblock to help keep motorists safe near a tornado-producing storm, creating a long backup of storm chasers. Livingston was chasing that storm, too, and said even before the roadblock was implemented he saw people setting up tripods halfway in the road as traffic was zooming by. The chaser convergence near the Dodge City storm was so bad, there were a few reports of mobile internet going down. The next day, Wednesday, was even worse. 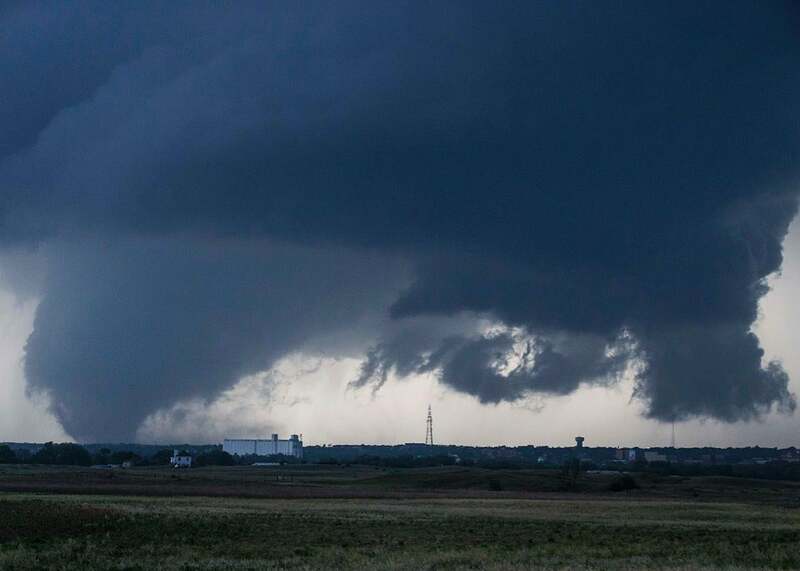 That day’s main tornado was a monster EF-4, with wind speeds of up to 180 mph, that was on the ground for about 90 minutes near Chapman, Kansas. At one point, the tornado crossed I-70, the main east-west highway in Kansas. Livingston was there, too. “There were a bunch of chasers just stopping on the highway,” he said, and saw two or three police cars stopping and telling people to keep moving. As semitractor-trailer trucks were driving past at 75 mph, members of the general public were pulling over to talk to chasers and figure out what was going on. Highways are not picnic areas. This is not a good practice. Alarmed by the size of the developing tornado, Oklahoma City TV meteorologist Mike Morgan told his viewers to leave their homes and “go south”—a regrettable and dangerous act that likely contributed to tragedy. Four other people also died in the tornado in their vehicles on the interstate, and at least 16 more died in related flooding, including a family that had taken refuge under a highway overpass. It was the worst-case scenario. University of Oklahoma grad student Sam Lillo was chasing near El Reno that day and was stuck at a standstill in traffic. A trampoline had just flown into a power line in front of his car, and he and his chasing partner were frantically searching for side roads to escape. “There’s just nothing you can do … we just sat there and hoped for the best.” That storm was a particularly heavy rain-producer, as well, which decreased visibility of the tornado and added to the danger, but the traffic was the worst part. In a jam like El Reno, “the scary thing is when you don’t have any freedom to make your own choices anymore,” Lillo says. And that’s when people start dying. Many chasers attempt to rationalize their presence by thinking their public accounts of weather conditions might save lives. Though weather radar technology has quickly advanced in recent years, for forecasters nothing beats having a visual of a tornado from a trusted source to issue an official tornado warning. But in reality, storm-spotting services are best provided by trained locals with whom the National Weather Service already has an established relationship. The National Weather Service has 122 local forecast offices whose job it is to issue severe weather warnings and work with local law enforcement to maintain constant communication with trained members of the public via social media, phone calls, and ham radio on busy weather days. Reports from out-of-towners are frequently given less priority, if only due to the sheer inability of forecasters to vouch for a report from an unfamiliar person in real-time. And the amateurs might be making it harder for professionals to do their jobs. One tornado researcher, Robin Tanamachi from Purdue University (who was my officemate back in grad school) had to alter her mobile radar science agenda slightly this week near Dodge City because of the chaser traffic. Earlier this year near Wichita Falls, Texas, controversy erupted within the chaser community when a local ham radio network finally had enough with clogged airways and restricted further reports from out-of-town chasers. There are no easy answers. Short of more police roadblocks, there’s no good way to ban “extra” chasers from public roads. But if chasers didn’t learn from El Reno, I’m not sure even roadblocks will be enough. *Update, June 2, 2016: This post has been updated to clarify that the lawbreaking act chasers were potentially committing was not paying a toll.